The last of my Christmas orders. A few weeks ago a friend of mine approached me and asked me if I could help her with a Christmas project for her young daughter. Of course I jumped at the chance to sew something for a little girl. So last week we went shopping for fabric to match the kitchen set that she was up cycling out of an old entertainment center. I would love to have a little girl to do this with but it was awesome being able to be part of this project none the less. So last week we went shopping for some fabric and she already had in mind what she wanted. Let me tell you this makes projects so much easier when you know what your customer wants to work with. 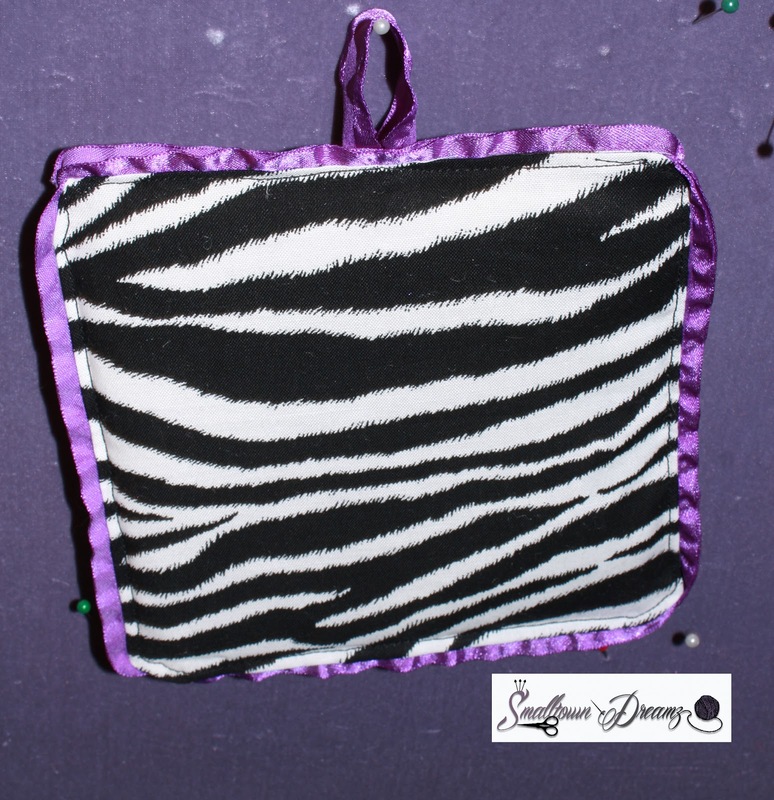 So she had picked out the zebra fabric for her little girl with a dark purple trim. We had picked out this awesome ruffled ribbon along with a small section of dark purple satin that is being used as an accent on the main piece. 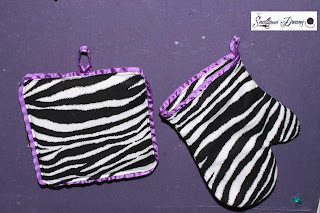 So the first 2 things I finished were the hot pad and oven mitt. I have to admit after they were done I wanted to make a pair for myself. 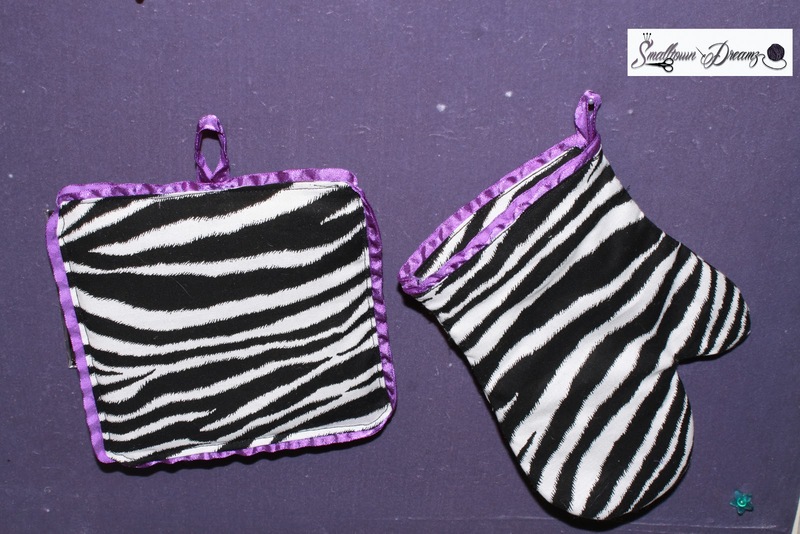 Both the oven mitt and the hot pad are insulated so that she can use it later in life when she is helping mom in the kitchen. Next on my list were 2 small curtain panels. 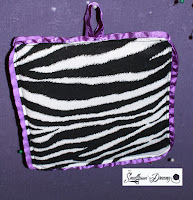 Once again for this I used the zebra print and the purple ribbon trim for an accent. 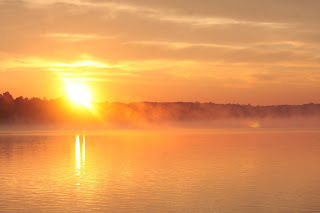 As you can see in the picture I am only showing one. I actually just finished the other one while I was writing this and my battery on the camera is charging. I will make sure to show a finished photo with both panels. Last on my list is an apron. I am so excited about this. It is my first real garment type project. Like I said I will be sure to post final pictures of the entire project after it's completion. For the entire project I decided to create all my own patterns to cut the fabric out from. Keeping in mind that I just started sewing this year, I think that I have shown a bit of improvement over this past year. 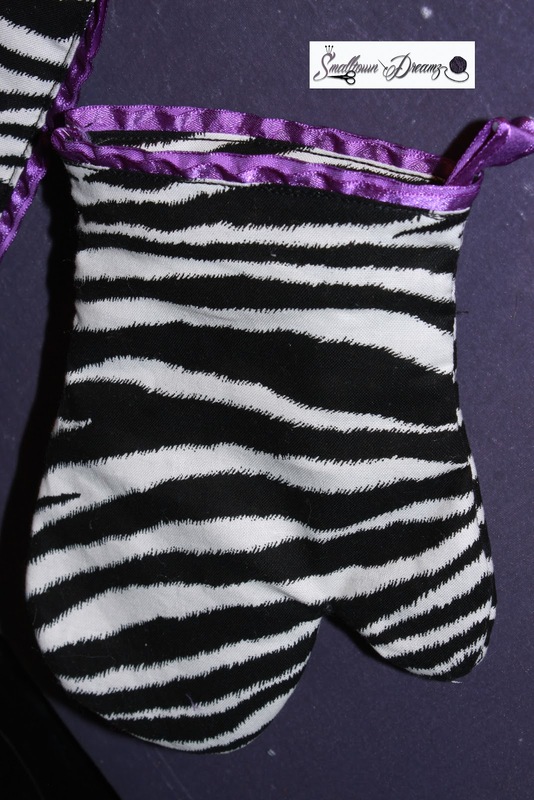 I am hoping to have the hot pad, oven mitt, and apron set on sale in my ETSY Shop my mid 2013. I would love to hear your thoughts on this project.